Just look at that storefront. A mass of black tarp, with only a bone hanging by a chain to let you know that anything could possibly exist there. Deja vu, but more on that later. Nate from www.ramenate.com had written about this place before, but I had never really given it a second thought. 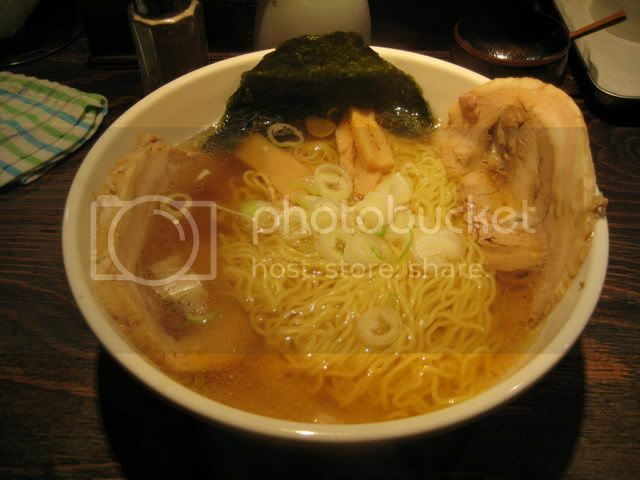 Takadanobaba has upwards of 100 ramen shops, so finding the gems can be tough. But, if you are reading this, you have been told. You need to go here. Push back the black tarp door, and have a seat at one of the 5 stools in the shop. Did I mention that this shop is sometimes closed because "the soup isn't perfect today." This is serious ramen. Perfection. It's a shio soup. I had the one flavored with a little shrimp oil. Deja vu... more on that later. There are some other options, like one topped with gyoza instead of the pork. Get the pork. Eat half your bowl, then add some spice. Minced green chilies. It's a perfect match. I want to go back tomorrow. On the wall is a photo of the founder of this family of shops. Speaking of family, there is a family tree type chart of all the shops. Most are in the Tokyo area (apparently at one the staff wear Mexican wrestling masks). But one is in Osaka. Hmmm, I went to Osaka once. About two and a half years ago. Let me search out my trip. Sure enough, I had been to the Osaka branch. Who could forget that giant bone hanging in front. And who could forget the simple, amazing soup. I thought about it some more, and realized it. This was the shop that inspired me. I was alone in Osaka, sitting in my cheap business hotel room, watching TV. 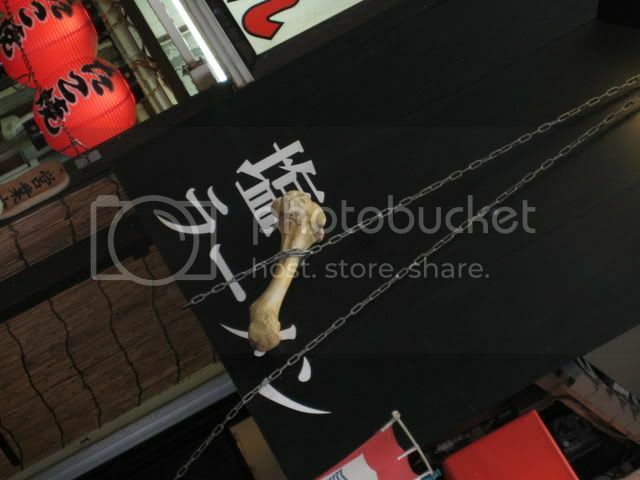 A local celebrity eating food type show came on, and they ate at a ramen shop with a crazy facade, the bone hanging out front a black shop. I literally had nothing to do, why not find this place. It would be good for a photo at lease. I recognized a nearby building and spent about 4 hours the next day trying to find it based on visuals only. Something only an obsessed ramen fanatic would do. Something I had never done before. Something I would do many many times in the future.